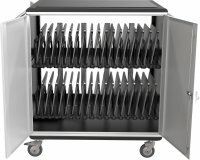 42 Inch Multimedia Workstation Cart - LP42E-B. 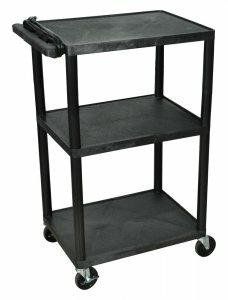 Versatile media cart or standard computer workstation. Unit includes a surge suppressing electrical outlet and 4" casters, two with locking brakes. Integral safety push handle is molded into narrow side of top shelf. 3-outlet, 15' surge suppressing electric, UL and CSA listed. Lifetime warranty. Polyethelene shelves and legs will never stain, scratch, dent or rust.